To Cite: Rahimi H, Gharahdaghi M, Parsa A, Assadian M. Surgical Management of Acetabular Fractures: A Case Series, Trauma Mon. 2013 ; 18(1):28-31. doi: 10.5812/traumamon.7164. Introduction: For decades, acetabular fractures were treated conservatively. Judet et al. in 1960s established the operative treatment of these fractures by continuous improvement of pre-operative evaluation and classification of fractures. Several studies demonstrated that accurate fracture reduction decreases the incidence of post-traumatic arthritis and improves functional outcome. Case Series: We report 67 consecutive patients who underwent surgical treatment for acetabular fracture; 44 patients were available for follow-up. In 35 (79.5%) cases, congruent reductions were achieved. The final mean Harris hip score was 81.8 (53-95). Functional outcomes according to Harris score were excellent and good in 31 patients (70.5%). Conclusions: The results of internal fixation of displaced acetabular fractures in our series were satisfactory. Fractures of acetabulum and pelvis constitute only 2% of all fractures (1, 2) but they are associated with significant morbidity and mortality due to associated injuries (3). Several studies demonstrated that accurate reduction and rigid internal fixation can decrease the incidence of post-traumatic arthritis and improve functional outcome (4-6). Clinical outcome after acetabular fracture surgery is difficult to predict. Poor bone stock in older patients, comminuted articular surface fractures and poly-trauma patients with multiple co-morbidities are adverse factors influencing outcome (7). Current trends in the treatment of these fractures include open reduction and internal fixation (8) according to the principles that apply to all inta-articular injuries. Judet et al. in 1960s classified these fractures and established the principles of operative management (9). Kebaish et al. in a long term follow–up study, indicated that the results of non-operative treatment in displaced acetabular fractures were inferior compared to those of operative treatment (30% satisfactory results versus 80% satisfactory results in the surgical group) (10). The current study reports 15-yr. results (1996-2010) and functional outcome of surgical treatment of variable types of displaced acetabular fractures. 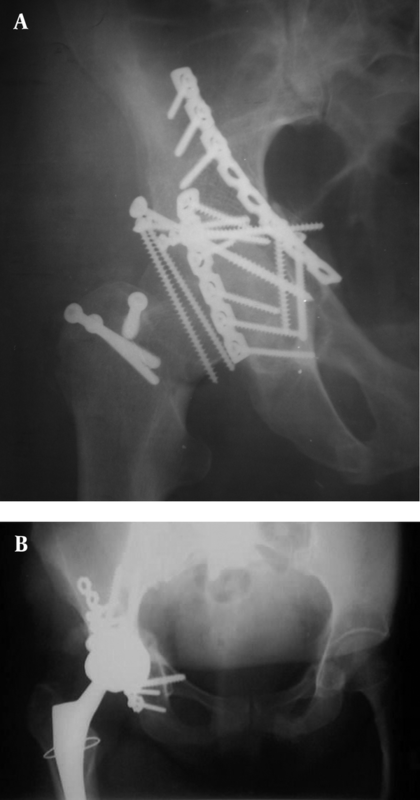 Between March 1996 and September 2010, 67 consecutive patients underwent surgical treatment for acetabular fractures at the Mashhad University Trauma Center. Surgical criteria were acetabular fractures with 2 mm or more displacement in the dome area of the acetabulum, roof arc angle measurement of less than 45 degrees, presence of intra-articular fragments, posterior joint instability, irreducible fracture/dislocations and the need to reconstruct the socket for total hip replacement.Unfortunately 4 cases died due to poor general health and associated injuries and 19 cases were lost to follow-up. Therefore there were 44 patients with complete data. Among these cases there were 34 male and 10 female patients; their age at the time of surgery was between 17 and 78 (mean 43.1 years old), in 19 cases the left acetabulum and in 25 cases the right acetabulum was fractured. The mechanism of injury was road-traffic accidents in 38 patients, fall from a height in 4 and in 2 cases the fractures were due to other causes.There were 9 associated injuries, including 2 cases of head injury,2 abdominal injuries, 2 incomplete sciatic nerve injuries (both had only proneal nerve involvement), one ipsilateral subtrochanteric fracture, one ipsilateral femoral shaft fracture and one contralateral femoral shaft fracture.After clinical evaluation and initial resuscitation, all patients had preoperative X-rays taken and a CT scan was also performed for patients admitted after 2001. All fractures were classified according to the criteria of Judet et al. ; 16 were simple and 28 complex fractures (Table1). Surgery was performed via the "Kocher-Langenbeck" (lateral position), "ilioinguinal" and "extended iliofemoral" approaches (11). In 7 cases trochantric osteotomy was performed for better reduction. Most of the patients were mobilized non-weight bearing 2 days after surgery; weight bearing progressively increased in the following 6 weeks with full weight bearing permitted after union of the fractures. Indomethacin was prescribed 75 mg daily for 6 weeks as a prophylaxis for heterotopic ossification. For prevention of DVT (from 2001 onward) low molecular-weight heparin was administered for 10 - 14 days post-operatively. Patients were followed up by clinical and radiological evaluation at 6 and 12 weeks, 6 months post-operatively and then yearly. Follow-up consisted of imaging evaluation and functional evaluation (Harris hip score). The average follow-up period was 62.1 months (range 13 - 156 months). Thirty-six (81%) of patients were operated within 2 weeks of injury. Five cases were referred late to trauma center and 3 patients had associated injuries, thus 8 patients were operated after the ideal 2- week post-injury period. A Kocher-Langenbeck approach was used in 20 (45.4%) cases, an anterior ilioinguinal approach in 16 patients (36.4%), and an extended iliofemoral approach in 8 patients (18.2%).There was no residual instability or nonunion at the final follow-up. In 35 (79.5%) cases, congruent reductions were achieved. The remaining 9 patients had incongruent reduction of their fractures: In 5 patients both column fractures were operated 2 weeks following the injury, there were 3 central fracture dislocations with severe comminution (Figure 1) and 1 anterior column posterior hemi-transverse fracture. The final mean Harris hip score was 81.8 (53-95). Functional outcomes according to Harris score were excellent or good in 31 patients (70.5%) (Table 2), poor in 5 patients (11.4%) with mean Harris score = 59, all of which had incongruent reduction. In the current series, radiographic congruency correlated well with functional scoring (P < 0.05, t-test). Mean Harris score of "incongruent reduction group" was 67.3 compared to 85.5 in the "congruent reduction group." It seems that, age affected functional results. Mean Harris score in patients under 40 was 85.3 compared to 79.7 in patients over 40 years old (P < 0/05, t-test).There were five (11.4%) early complications, including 2 (4.6%) deep vein thromboses treated by cardiologists and 3 (6.8%) wound infections treated by surgical debridement. There were 2 (4.6%) heterotopic ossifications (HO) following a Kocher-Langenbeck approach both of which were treated non-operatively and 2 (4.6%) patients developed symptomatic post-traumatic arthritis managed by total hip arthroplasty (Figures 2A and 2B). Reduction was lost in one of the patients after surgery ; there were no cases of implant failure at final follow-up. Acetabular fractures are commonly classified by the "Letournel" and "Judet" system (1). This classification system describes the fracture in terms of elementary fractures and associated fractures (7). The outcome is potentially dependent on personal characteristics of the patient and circumstances of the accident (12). Type of fracture, displacement and comminution as well as concomitant diseases have been said to affect clinical outcome (13). In the current study, 70.5% of patients had good or excellent results which is comparable to several studies (11, 14, 15). Young patients aged < 40 years at the time of injury had better final outcomes; this correlation was also noted by Libergall et al. (16). It was shown that congruent reduction leads to much better functional outcome with statistically significant differences in Harris scores. Results of the current study indicated that the functional results correlate well with the quality of reduction. Non-congruent reduction was shown to be the main cause of unsatisfactory results. 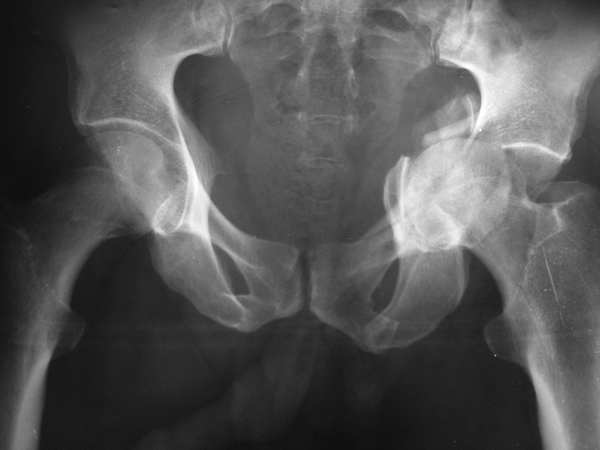 Extensile approaches to the hip joint have a high rate of complications (17-19); Up to 67% develop heterotopic ossification (HO) even with the use of post-operative irradiation as prophylaxis after the extensile approach (16, 20). Infection rates reported in such studies vary from 0-3% (16) to 5-12% (16, 19); and the infection rate in the current study was 6.8% which is comparable with these studies. Thromboembolic complications had a low rate of 4.6% comparable with the existing reported cases although MRV (Magnetic ResonanceVenography) (21) was not used in the current study. Two (4.5%) patients went on to have total hip replacement within 2 years of surgery, this incidence was low in contrast to other studies (22, 23). It should be mentioned that 88.6% of the patients in the current study underwent the operation within 2 weeks after injury. In conclusion, a good/excellent functional and radiological outcome was observed in 70.5% of operatively-treated patients. A significant association was found between a sub-optimal clinical outcome after fracture of the acetabulum and 3 prognostic factors (imperfect fracture reduction, complex fractures and age). Complex fractures raised the odds ratio of sub-optimal to satisfactory outcome at least 4.6 times compared to a simple fracture. Results of the current study are comparable with other studies (12, 15, 16). Authors greatly appreciate the help of their colleagues at the Department of Orthopedic Surgery. Authors’ Contribution: All authors contributed substantially to the conception, design and interpretation of data.